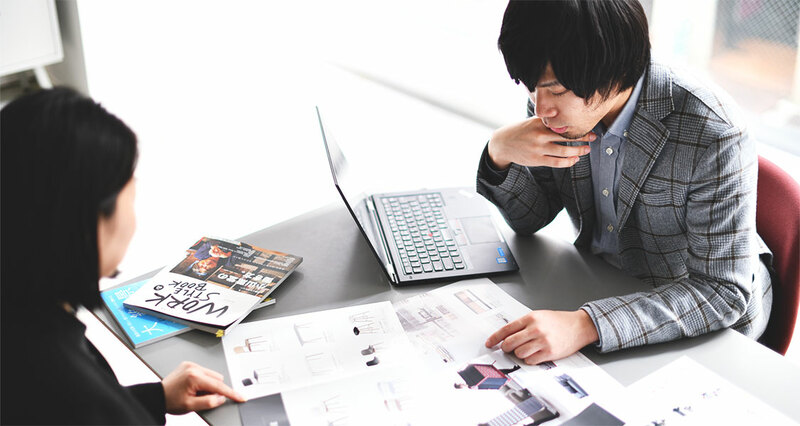 プロジェクトを成功へと導く。 The success or failure of a project is determined by the process. We establish specific goals, envision the process to achieve those goals, and execute that process; pulling together both internal and external talent and expertise to compose the team and guide the project to success. 何を創るか導くディレクション、クライアントの特性に合わせたコンサルティング、計画通りに実現するマネジメントの3要素をプロジェクトの特性に合わせて提供します。 Based on a deep understanding of the client, we make the project’s objectives clear and advance it in a specialized and integrated manner to realize these objectives. We deliver the three elements of direction on what to build, consulting suited to the client’s needs, and management to realize the project according to plan—all in accordance with the distinctive properties of each project. 導き出されたプロセスに沿って、社内外含め最適なチームを編成し、プロセス通り進められるよう適切な場を設定し牽引します。 As a partner belonging to the client’s team, we set the objectives and goals for the project. We propose a project plan (budget, schedule, and structure) envisioned to realize these and identify what needs to be done, and how, to make the project real. Then, we plan processes through strategic study of how to meet the goal. We form optimal teams, with membership chosen from both inside and outside the company, for carrying out the resulting processes as planned, and we set up appropriate conditions for moving ahead through the designed processes and drive the project forward accordingly. また並行して建築条件、施設設備、ICT環境、中期経営計画など周辺情報についても把握を進め、将来の予測も踏まえた実現可能な要件としてまとめます。 We identify concepts and requirements for realizing the goal. In most cases, we conduct surveys and interviews to gather both quantitative and qualitative data, and then we summarize the results of these studies. We use these results to ascertain any issues or needs and then identify essential topics and insights based on discernment. We find ideas for solutions regarding such issues and insights using workshops and other methods, and through doing so we identify the workplaces, working styles, and programs needed to realize the objectives. At the same time, we also make progress on ascertaining related information such as construction conditions, facilities and equipment, ICT environments, and medium-term management plans, bringing together realistic requirements based on considerations including future forecasts. 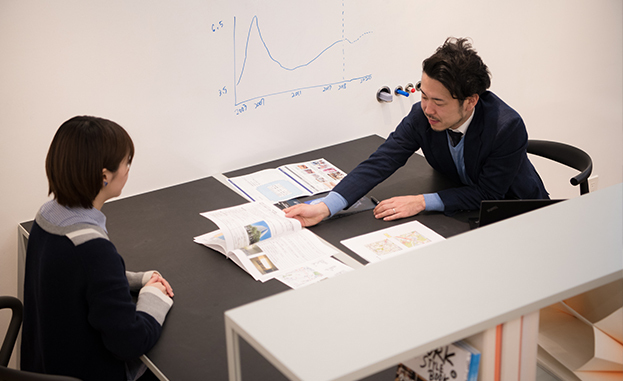 その上でプランの調整を行い内容をまとめます。 Based on the concepts and requirements developed, we assign an optimal design team, with membership chosen from both inside and outside the company. The design team chooses the optimal method (e.g., seeking proposals or holding a competition) suited to the circumstances of the project. Next, we coordinate the preparation of a plan suited to these concepts and requirements, in cooperation with designers. Through consideration of working styles and equipment plans conducted in parallel with this task, we develop a plan that reduces the need for rework and is suited to actual operations. When the basic design is complete, we calculate rough budget estimates and verify the plan’s cost effectiveness. Next, we adjust the plan and finalize its content. また工事を行う複数社間と工事定例会議を行うことで、各社ごとに干渉する工事についても段取りを整理することで、スムーズに竣工するよう現場をコントロールします。 We optimize costs, construction details, construction processes, and build quality. Using the proposal request summarizing the content of various designs and plans as well as construction conditions, we handle the bidding process for each type of construction and choose the optimal partners. After bidding, we make final arrangements of construction details, construction processes, and construction methods. This makes it possible to place orders while securing the budget, schedule, and quality requirements. In addition, through periodic construction meetings with multiple companies involved in the construction and sorting out any construction-related conflicts between companies, we control the construction site properly so that the project can be completed smoothly. クライアントの意図と文脈を深く理解した上で、コンセプトを創り、アイディアを生み出し、機能を満たす設計をすることで生き生きとしたストーリーを持つ場・物を創り出しています。 Our work spans a wide range of design fields, including interior design, architectural design, product development, and graphic design. We create places and things that embody narratives full of life, through generating concepts and ideas based on a deep understanding of the client’s intentions and contexts and creating highly functional designs. デザインシンキングに沿ってアプローチを行うことで、驚きと納得が両立するプロジェクトコンセプトを生み、意図・目的を持った場を創り出しています。 We ascertain the client’s current circumstances, identify the issues it faces, and deepen our understanding of its vision, to envision a bold yet practical project concept that shows the kind of place to create. 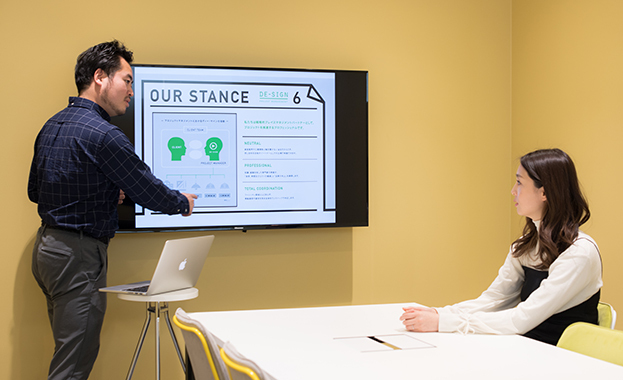 Through our approach based on design thinking, we generate project concepts that deliver both unexpected touches and client satisfaction, creating places that embody the client’s intents and goals. デザインに関するすべての領域について、デザイン面での合意を行うプロセスになります。 In the basic planning stage, we develop the design concept by understanding the project concept and requirements at a deep level and building on its narrative. Then, we develop a practical basic design to give concrete form to the design concept. The basic design involves design necessary for realizing the project, including zoning, the basic layout, configuration of various operations, confirming applicable laws and regulations, designing various pieces of equipment, considering materials, considering conversion plans, and choosing new fixtures. When the basic design is complete, we conduct a design presentation and establish the framework of the design. This is the process in which agreement is reached on all areas involved in the design. また入札後に必要に応じてバリューエンジニアリングを行い、コスト面を含めた最終的な設計内容を確定させます。 We prepare detailed designs for realizing the content of the basic design. We prepare a complete set of designs including floorplans, lighting plans, interior elevations, design details of specific components, furniture plans, and finishing plans, including detailed specifications and dimensions. These designs are based on an understanding of standardized specifications used by all related parties, so that they can be used for estimates and bidding by contractors and furniture suppliers. As needed, we also offer value engineering following bidding, to finalize the ultimate design details, including costs. また最終的なドキュメントとして、竣工図の取りまとめまで含めて行っています。 During the construction period, we carry out design management to check on whether or not construction work is being conducted correctly in accordance with execution drawings. If construction adjustments are needed, we issue decisions an instructions as the designer and check for any discrepancies in construction methods or details. After construction is complete, we conduct design inspection and client inspection, issue instructions to contractors for corrections, improvements, repairs, etc., and check on the completion of corrective work. This process includes coordinating completion plans, as the final documents of the project. プロジェクトを行うべきかどうかの検討、環境を維持継続するための日常業務の支援、PDCAのための定期調査を提供しています。 We support management based on the facility management (FM) cycle, to enable places to be used over longer time frames. We help consider whether or not a project should be implemented, support survey operations for maintaining the work environment, and offer periodic studies for implementing the plan-do-check-act (PDCA) cycle. プロジェクトは大きな予算が必要となるため、実行するかどうか、中長期計画、投資対効果の検証を行った上で判断を行えるよう支援します。 We meet with the client in advance to ascertain its circumstances and the kind of solutions it seeks. Through study of matters including timelines and budget, as well as current conditions in the real estate market, we propose optimal methods such as renovation, expansion, and relocation. Since a project requires considerable budgetary resources, we support clients in making decisions on whether or not to proceed based on review of medium- and long-term plans and returns on investment. また必要に応じて、コンセプトを浸透させるために経営層からメッセージを伝える場を設けたり、場に対して愛着を持てるよう一緒にペイントを行ったり、ユーザーひとりひとりが「自分たちの場」として感じられるような施策を行います。 We prepare rules summarizing management of both the workplace and working styles, covering the concept of and the actual functions, equipment, uses, and procedures in the new space. By communicating the details to users in advance, we make it possible to start use of the facility smoothly. Also, as necessary we set up opportunities for communication of messages from top management to help spread understanding of the concept and arrange group painting activities to build an attachment to the place, so that each individual user can feel that it is or her own place to be. 上記により、場をより長い期間、最適な状態で使用できるよう運営支援します。 We deliver support for continual maintenance and updating of the space. 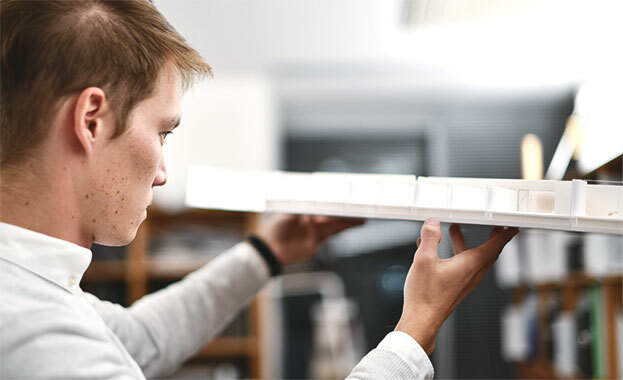 We handle a wide range of fields that play essential roles in workplaces and working styles, such as interiors, equipment, furniture, and ICT tools. In addition, we run through the plan-do-check-act (PDCA) cycle and facility management cycle by checking on user satisfaction and changes in importance through follow-up and periodic studies of the project (PLAN→DO) and make improvements as needed, followed by implementing the CHECK→ACT functions. In these ways, we support clients in putting their spaces to use under optimal conditions over longer periods of time.